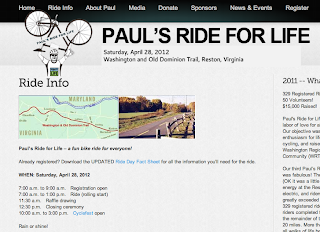 Paul's Ride for Life—Saturday starting at 7am. Start at Reston Town Center Pavilion. All rides are out and back along the Washington and Old Dominion (W&OD) Trail. The route is paved asphalt. The ride includes 10, 20, and 1/2 Century +2 mile options. The Bike Lane Cyclefest Expo—Saturday starting at 10am. Join The Bike Lane for our 6th Annual Cyclefest Expo. A day to celebrate cycling at Reston Town Center Pavilion! Cyclefest Expo is open for everyone from 10 am- 3 pm. Trek, Felt, and Niner Demos will be available from 10-2:30 pm. Kids Bike Rodeo, sponsored by Trails for Youth, will be from 12:30- 3 pm. Group mountain bike ride to Lake Fairfax, sponsored by MORE- 11:00 am and 1:00 pm. Bicycle Safety Rodeo—Saturday from 1-4pm at Lake Newport Pool, Reston. Join the Reston Association, State Farm Insurance Co., and The Reston Bicycle Club for our Annual Bicycle Safety Rodeo. Children will complete 8 safety stations and earn their bicyclist’s license. Children must bring their own bicycles and helmets. No registration required. This event is canceled in the event of rain. Contact Ashleigh@reston.org or call 703-435-6577 for more information. Spokes, Etc./Trek Bicycle Demo—Sunday 10-3pm. Join Spokes Etc. and Trek Bicycles on Sunday, April 29th for a Bicycle Demo and Education event at Lake Accotink Park in Springfield, VA. Take advantage of this opportunity to take a brand new 2012 Trek bicycle for a real-world ride. Choose from mountain, road, triathlon and cyclocross bikes and ride them where they were meant to be ridden – on the trails, roads, and gravel paths.